Supplying an exotic range of Venetian Blinds with self aligning system, we offer superior quality product which adds on attractive looks to the interiors. Delivering an effect of curtains these venetian blinds are available in variety of styles such as plains, perforated & prints to tapestry and prevent moisture and dust entry. we are providing a wide range of Chick Blinds to our reputed clients at very reasonable rates. Blinds are of different types. Commonly used in offices are vertical or venetian blinds. Other types are roman, roller, wooden etc. 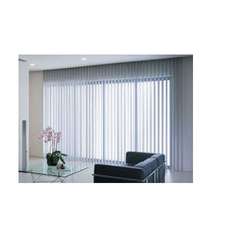 We are the leading firm of Vertical Blinds. To sustain the quality, our products are made under the guidance of industry certified professionals. In addition, we present this product at nominal prices.